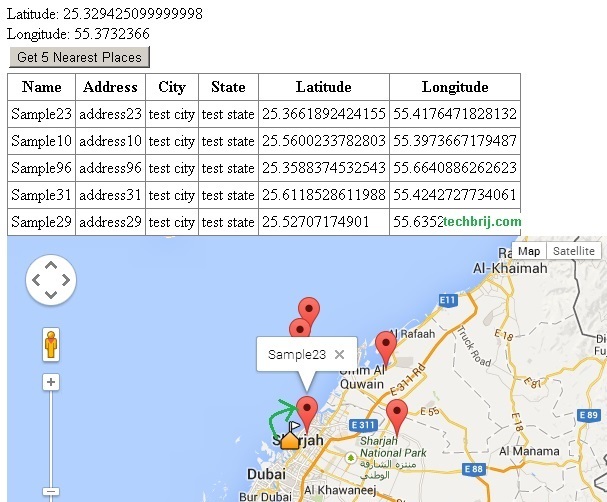 In my previous tutorial, we implemented to save Geolocation (latitude, longitude) in Geography data type column in Sql Server. Now, we will get the nearest N places from the current geo-location of user. Environment: VS2012,.NET Framework 4.5, ASP.NET Empty Website template, C#, SQL Server v11.0, Entity Framework 5.0 Database First approach. Hidden field is used to save current user geographical position similar to previous post. On submit, Gridview and Map will display the nearest 5 places. We use same HTML5 Geo-Location API to get current user geographical position. By default, submit button is disabled. It is enabled on getting current user geo-location. Entity Framework 5 and above supports spatial type operations. Here we are doing order by distance from current location and take top 5 records in LINQ. EF5+ makes it very easy. In above code, currentLoc variable is used to hold current geo-location of user. We saw the application of Sql server Geography data type and good support of Entity framework which makes few lines of code to get the nearest N places done.